Have you found your debts slipping out of your control recently? Don't panic, follow this simple guide to sorting out your finances and deal with your debt. The best way to start putting your finances in order is to make a list of all your borrowing - including any unpaid bills, money owed to family/friends and any outstanding credit card payments. Take into account your personal circumstances, and from your list work out which debts are the most important and need to be paid off first. Think about what steps lenders have already taken to getting the money back from you - final reminders, referred to debt collectors, - these debts need to be settled first. Speak to the lenders if you foresee any problems settling the debt, they will be happy to work out a payment plan to help you get through this bad patch. After all, it is in their interest to help you. If you have a mortgage, or a loan secured against your home, make sure you put this towards the top of your list. Failing to repay this type of loan could result in your home being repossessed. 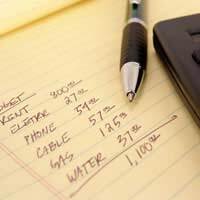 Once you have created your list, draw up a realistic budget. Start off by recording all of the money you have coming in, for example, your monthly earnings after tax or any pension or investment income. Then list every amount that leaves your account every month. This ranges from financial products, such as your mortgage or rent, house insurance, gas and electricity and your phone bill to household costs such as food and leisure time or child maintenance. A simple calculation - incoming minus outgoing - will reveal how much money you will have left over each month to maybe put into a high interest savings account, such as an Individual Savings Account (ISA). If a simple re-structure of your personal finances won't provide as much help as you need, the best idea is to get some personal advice. There are companies out there that offer to help clear your debt. However, these 'debt management companies' often come with very high fees so probably aren't suitable for your current situation. Also, don't ever be tempted to pay a firm who claims to be able to 'repair your credit history'. If you have been in debt and are sorting out your finances, the damage to your credit history will fix itself over time, paying someone to do it for you is a waste of money. There is also the option of consolidating your existing debts. This means taking out one large loan to pay of all of your other debts, leaving you with one monthly repayment. However, be careful when considering this, and make sure you hunt around for the best deal. It isn't advisable to rely on this form of credit to get over any debt problems, so once your debts are sorted out, try your best to keep on top of your finances. Over time your credit rating will improve if you stay on top of all your monthly repayments, and if you find your debts slipping out of your control once again, then simply follow these steps and sort yourself out. Payment Protection Insurance: Could You Claim Back Thousands?